This Olive Drive beauty is stuffed with a huge quantity of quality items. Cookwares, utensils, glasswares, pots & pans, appliances...over the top brands! Decor over the top! Garage, garden and patio items, even storage sheds. Jewelry (whole room full), designer handbags and clothing (closets full)......Coach, Chico's and Brighton to name a few. Vitamins, healthcare, haircare, skincare..... mostly new and top of the line brands. Books, CD's DVD's & VHS. Office supplies. Sewing machine, notions and great linens. 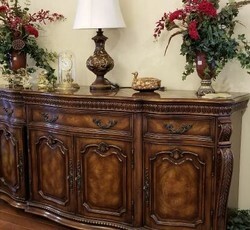 Some amazing sideboards/buffets. Entertainment center and TV's. Patio furniture and garage items. Tons of items, lots of new brand in the boxes. Some really cool unusual vintage items. 2005 Toyota Tundra truck, crewcab, 146,000 mi. 2019 tags, smogged, oil change, detailed, great shape, everything works great, everything power, automatic transmission. Great truck! Great buy!